A stereo setup with the LXmini requires four power amplifiers. For the two woofers I suggest a range from 50 W to 200 W max per channel into 8 ohm. 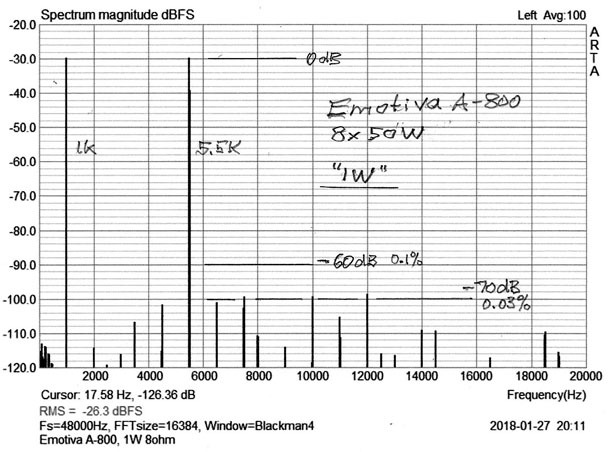 The frequency range above the 800 Hz crossover to the mid/tweeter requires considerably less power as I have deduced from maximum voltage measurements across the driver terminals. 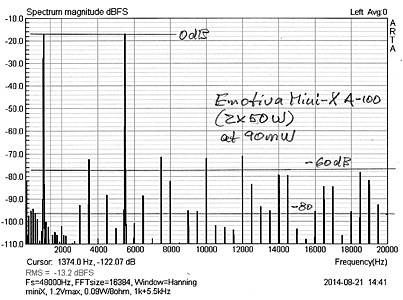 The maximum that I observed occasionally would correspond to 20 W into 8 ohm, but since the driver is 4 ohm the equivalent power is 40 W for the mid/tweeter. For development of the LXmini, and because I had it on hand, I have used the Emotiva UPA-500, which is a 5-channel, 70 W/channel amplifier with THD < 0.01%. The amplifier costs $350 and its performance-to-price ratio is amazing. It is no longer available. A pair of Emotiva MINI X - A100 might be an alternative. 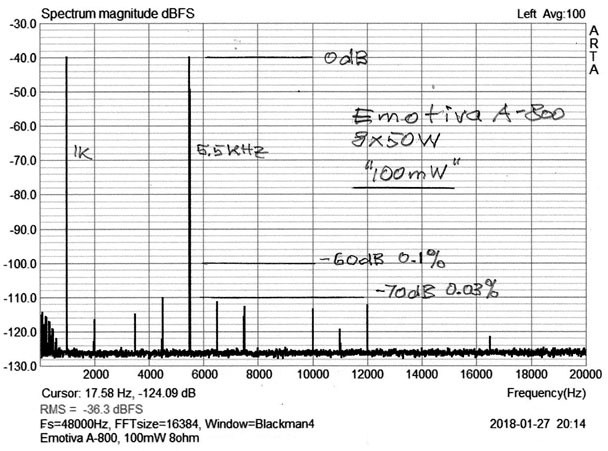 I know that there can be sonic and imaging differences between different amplifier designs, even when their frequency responses into the load are identical. The UPA-500 with the LXmini sounds neutral and spatially detailed over the whole frequency range, immediately and in long-term listing. I also have listened to different amplifiers and front ends through the LXmini and find the speakers revealing of sonic differences in equipment. Thus, if you like to play this audiophile game - and often endless search - the LXmini is a speaker that can make it fun and rewarding because it tells you right away if you have come closer or moved away from "reality". Stereo is an illusion, a mental construct of an acoustic scene, which the recording engineer has sampled with n-microphones and processed. The only connection to reality is your accumulated auditory memory of live acoustic events. The 3D rendering, which the LXmini delivers to your ear/brain perceptual apparatus from the cues in a well done recording, can be like a convincing magic show. 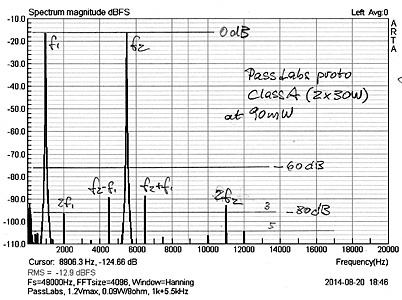 The difference in power requirements for woofer vs. mid/tweeter opens the door to Class-A power amplifiers for the higher frequencies, where amplifier differences are usually noticed first. 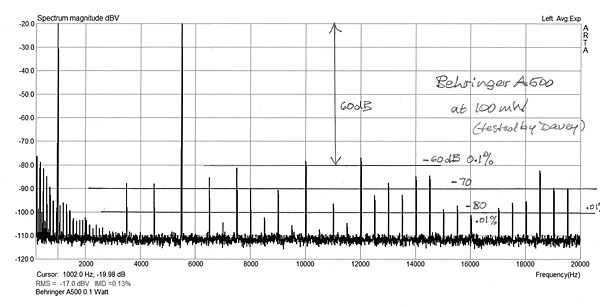 But the voltage gain of such amplifier must be made identical to the woofer amplifier's gain in order to stay within the dynamic range of the mini DSP 2x4. 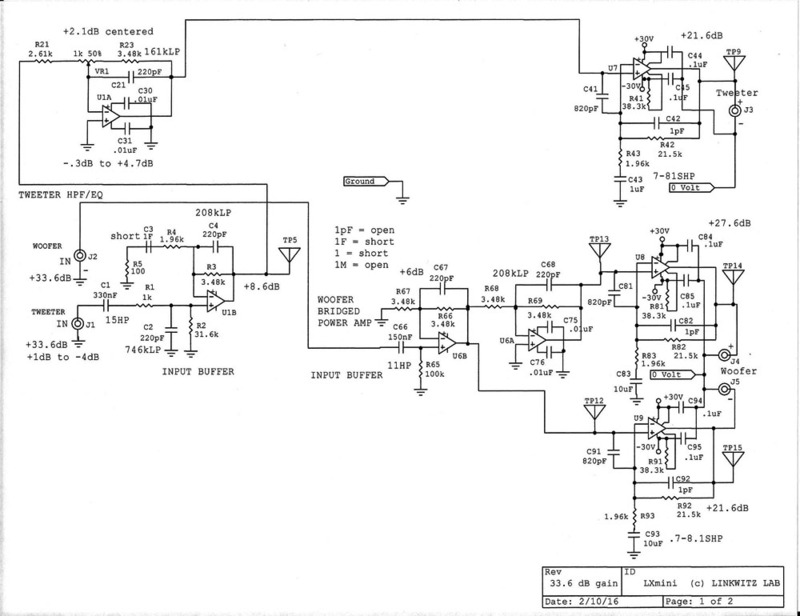 Most likely this requires a pre-amplification stage at the power amplifier input. 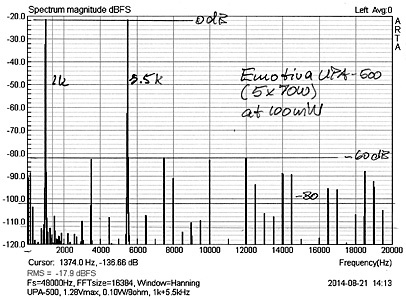 Also, the amplifier output impedance should be <0.5 ohm, i.e. 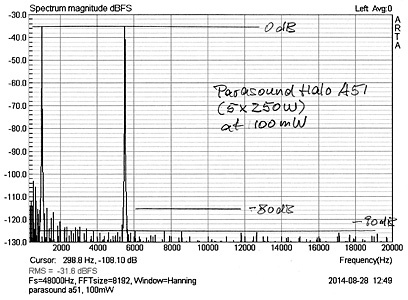 small compared to the rising voice coil impedance, in order not to affect the frequency response of the speaker. 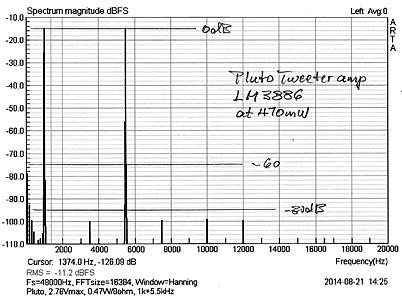 The LM3886 based amplifiers on the PLUTO pcb board are another option. 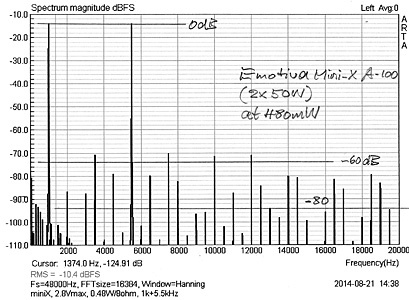 They actually measure quite a bit better than the Emotiva UPA-500 or MINI X-A100 for low distortion at 1 W and 100 mW levels. I give some guidance on the LXmini Owner Support page on how to adapt existing PLUTO amplifier modules for LXmini use, expecting some electronic know-how from the builder for completing such project. The chip power amplifiers that were housed in the base of PLUTO make superb LXmini amplifiers. The LXmini deserves better than the Emotiva UPA-500 or Emotiva mini-X. 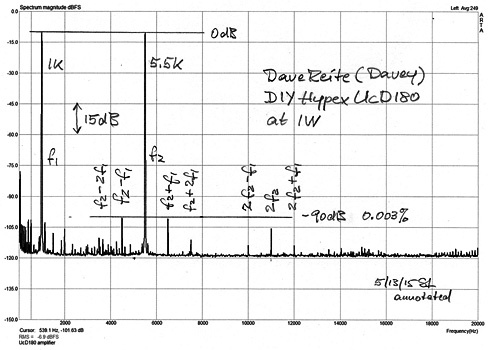 The 1kHz and 5.5kHz intermodulation measurement results, below, correlate well with perceived amplifier sound quality. 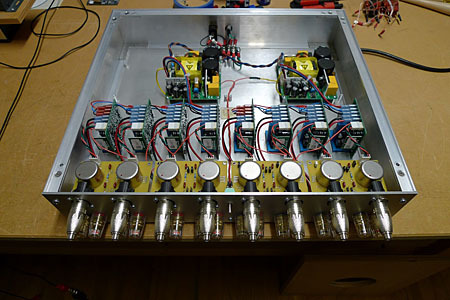 Don Naples (www.theorionspeakers.com) built me a 4-channel amplifier using two of my last few PLUTO pcb. Pictures of the amplifiers and circuit diagrams are shown below. 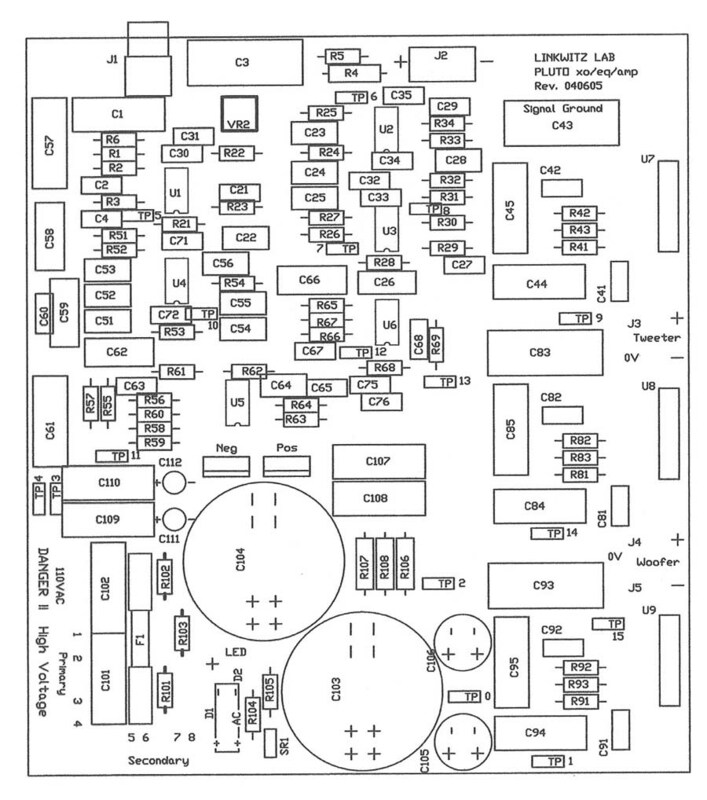 The PLUTO material list can serve as guidance for component selection, but the circuit diagram determines the component values. 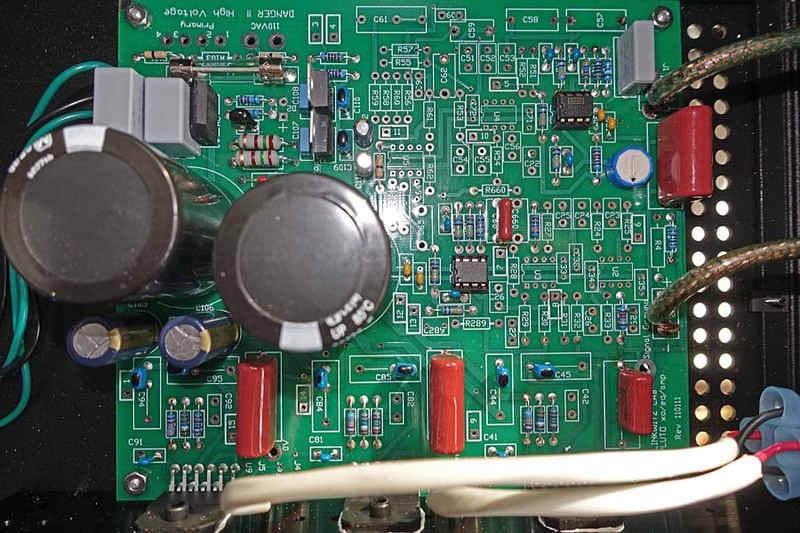 Building the amplifier is not a beginner's electronics project, because the pcb that was used is no longer available. 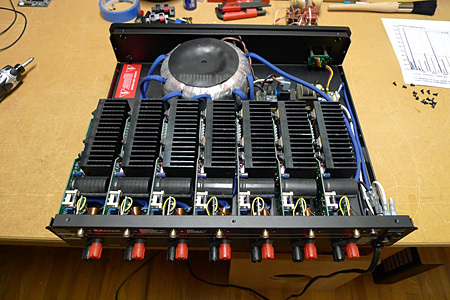 The design is shown here for experienced amplifier builders. 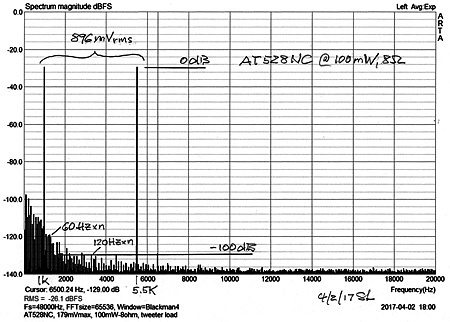 For many years I have been using ATI power amplifiers. 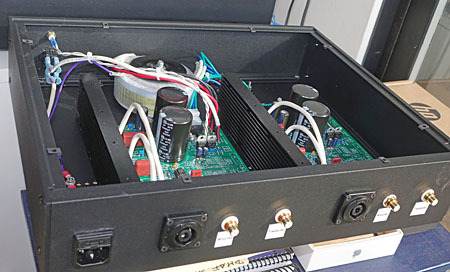 In their product line a pair of AT1202 stereo power amplifiers is well suited to the LXmini. 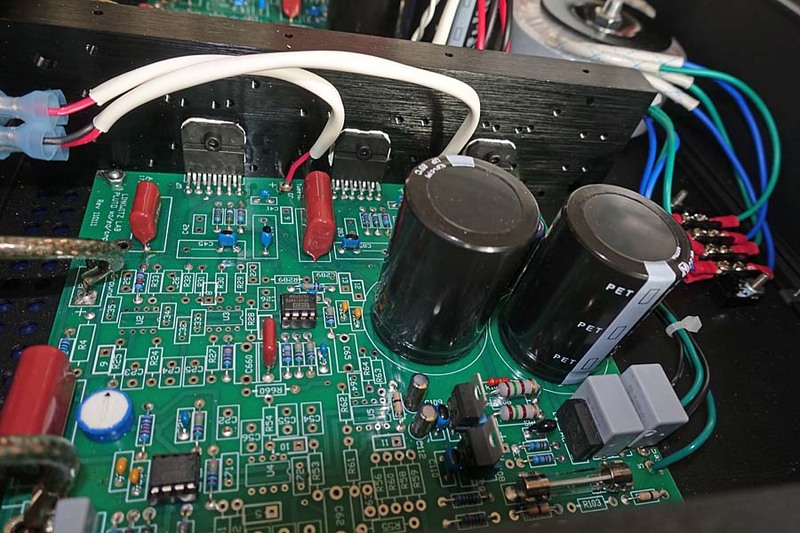 Each speakers would have its own 2x120 W stereo amplifier, which can provide as much peak current or peak voltage as you would ever want for the LXmini drivers. 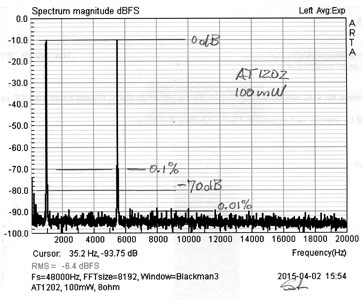 The AT1202 exhibits very good low power intermodulation distortion performance as seen in the graphs above. 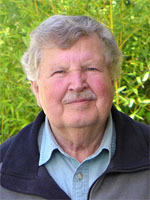 It is primarily 3rd order at 1 W in response to equal amplitude input signals at 1 kHz and 5.5 kHz driving an 8 ohm resistor. 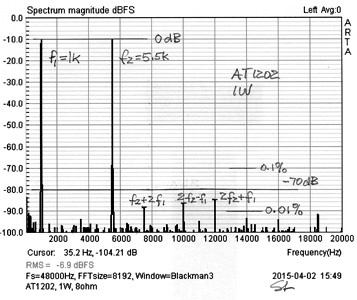 Harmonic distortion products are always lower amplitude than intermodulation products. 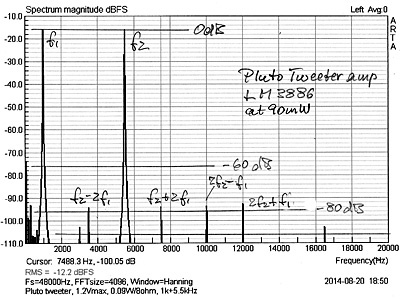 Unlike for many Class A/B amplifiers the distortion decreases as power goes down. 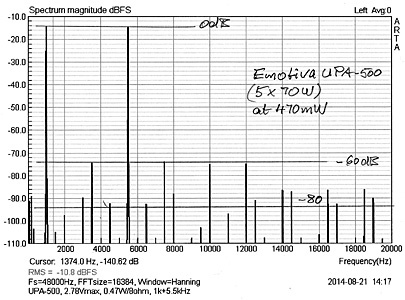 A 100 mW output level is not unrealistic. 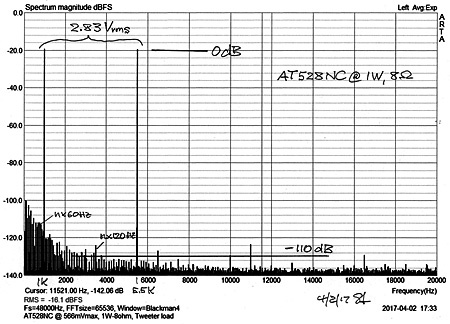 Early transistor radios had 50 mW output stages and made quite a bit of noise. A wide range of power amplifiers can be used for the LXmini. The primary requirement is that they all have the same voltage gain, otherwise you need to adjust the gain defined by the LXmini configuration file for the miniDSP 2x4 or 4x10HD. 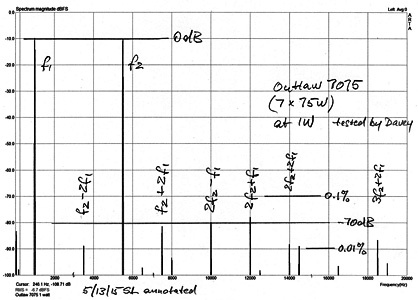 I have heard good things from a trusted source about the Outlaw 7075 7-channel amplifier, which measures similar to the AT6012. The Emotiva A-800, 8-channel amplifier, could be a low cost, satisfactory performance solution for LXmini, or LXmini+2, or LXstudio applications. Here are examples for which I have some measurements. If you ever wanted to upgrade the LXmini to the LXstudio, you would add 2 more AT1202 amplifiers to drive each dipole woofer baffle from its own amplifier. Should you then desire the LX521.4 you would add the AT1806, which drives the woofers and lower midrange while two AT1202 drive the upper mid's and tweeters. This leaves two AT1202 for the LXmini. 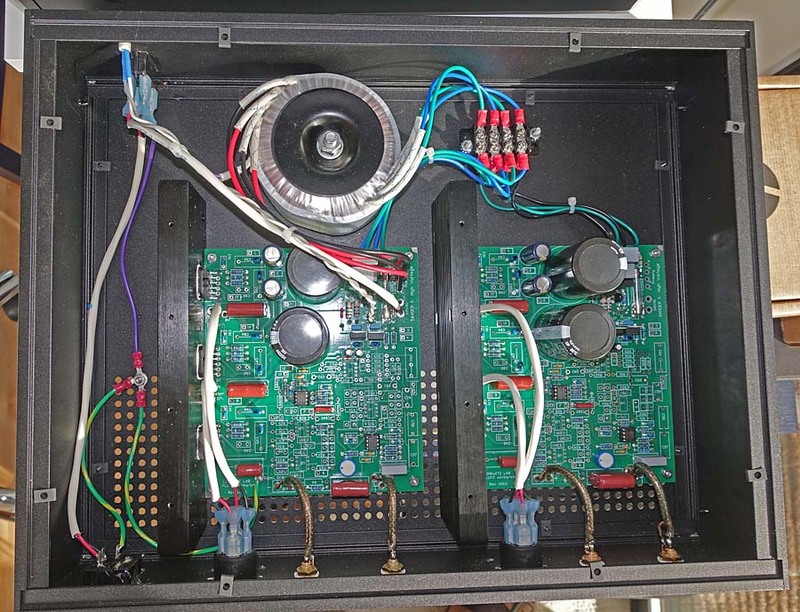 An LX521.4 can also be effectively driven from 10 of the AT6012 amplifiers. A single AT6012 can accommodate all configurations. I am using it for the LX521.4 in our Sea Pine Cottage.